Brian Gross Fine Art opens an exhibition of recent work by Marco Casentini, Teo González, and Ed Moses on Thursday, September 4th, with a reception from 5:30-7:30pm. The show will continue through October 4. The gallery will be exhibiting recent paintings and works on paper by these three well-known gallery artists. Marco Casentini, an Italian painter currently living in southern California, shows reductive monochromatic paintings on canvas. 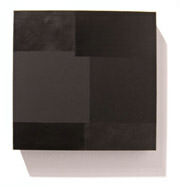 The subtle and refined black, red, and white canvases mark a distinctive new direction in Casentini’s work. These formal investigations of color and spatial play are comprised of multiple geometric planes created through layering a single color and changing the direction of the brush stroke. The seemingly simple compositions create a constant visual paradox between two-dimensional and three-dimensional space. Painted on canvas over board, with the painted planes continuing on the sides of the work, the implied overlapping textures continually flux between the flatness of the paint and their illusionistic depth to create distinct spatial tensions. Standing out from the wall, the paintings exist as a interplay of geometries emphasized by the flatness of their medium and their sculptural presence. 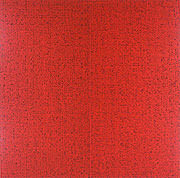 New York-based Spanish painter Teo González's paintings are methodical arrangements of small paint drops on canvas. His minimal paintings are comprised of thousands of individual drops of paint arranged within a grid formation, and using the variation of drop size and density to create subtle shifts of rhythm and pattern within each painting. In his monumental diptych, an eight foot square painting in two panels, González dropped 32,400 precisely measured drops of black paint on a red ground. Underscoring the process of the work and its relationship to the resulting effect, the titles of the new paintings denote not only the number of drops per painting and the colors of the pigments used, but also the gauge of the grid. Rhythmic patterns emerge from the dramatic color combination and the slight variations in drop density and shape. González's ink on paper drawing, a smaller work measuring only seventeen inches square and based on the same principles as his paintings, is a subtle and delicate grid of small drops. Major abstract painter Ed Moses continues his work with washed layers of rich, sensual color in tones of cobalt blue, black, and gray metallics, creating spatially sophisticated compositions. Oscillating between areas of congestion and fluidity, these paintings create effects that are at once primal and poetically lyrical. In his untitled diptych measuring four feet high by twelve feet in width, dense areas of washed paint push and jostle over the canvas, revealing vibrant areas of color highlighted by metallic flecks mixed in with the paint. Rich, velvety blacks give way to raw canvas flecked with droplets of blue and gray, setting the entire work in a kind of perpetual motion. Poured and visibly dragged across the canvas, the layers of paint reveal a distinct intuitive gesture and a continuous spatial rhythm. Moses' 40-year concern with abstract painting has yielded an array of styles and distinct bodies of work and in additional to his recent painting, this exhibition will also include Moses' smaller acrylic on mylar works.